Have you found an online vendor selling La Favorite Coeur d'Ambre? I have become a fan of agricole rum. The way its made delivers stronger sugar cane flavor reminiscent of when I was a child and would chew on some ribbon cane. The color is a warm amber...golden. Definitely has a sugar cane aroma. The flavor is classic agricole...strong sugar cane flavor with a little sweetness. They keep it in oak vats for only 18 months. Enough to give it its color and a little oak tang. Be forewarned however: this rum is 100 proof (50% ABV) so it does have a kick. Not a sipping rum for the timid. However a cube of ice or a little water tames it quite nicely and softens the flavor structure. Makes the cane flavor more pronounced but not objectionable. I think this would work quite well in cocktails especially those calling for an overproof rum. It is acceptable in Coke Zero. If you can find this I strongly recommend purchasing a bottle. It is quite different from molasses-based rums and definitely far removed from sugar-added rums. Delicious. Visited Martinique over the Holidays and went to the La Favorite distillery. What an amazing self guided experience followed by an open tasting bar. Bought a bottle of Rhum Coeur Ambré from the distillery. Nice bottle and label design. Amber color. 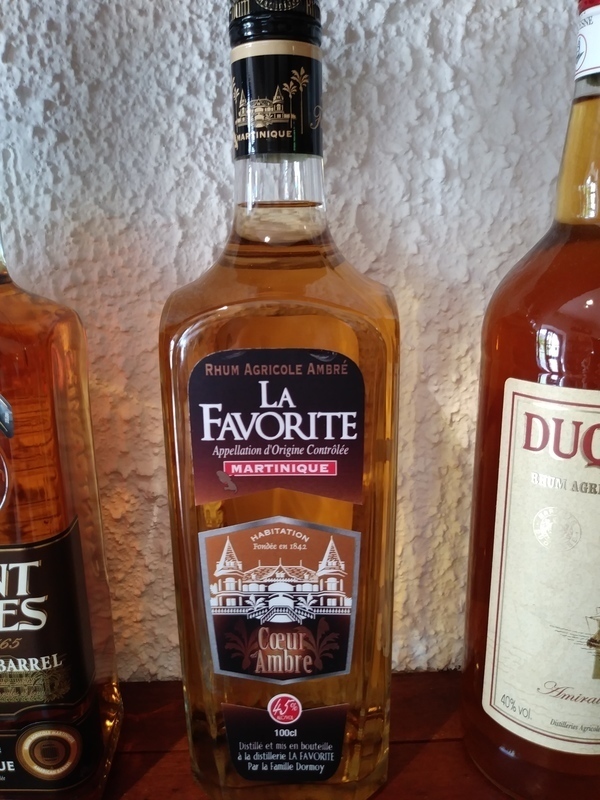 Typical dry Rhum Agricole flavors alongside grass, fruits, funk and mild oak followed by a strong burn being so dry. Rhum Agricole fan boys can easily add 2 points to my score. 50% ABV. Aged 18 months in oak. Huge nose. Cane, grass, corn, brine, funk. Peach? Same on the palate. Fairly rough. Not getting much oak, except for hint of tannins on the finish, which is short. My, what a rum! I've been nursing my bottle for quite a long time now and putting off a review because it's such an interesting, complex sip. But now it's almost gone! This is very similar to its younger sibling, but with a touch of aging (very different from the vieux, which is only 40%). A LF blanc or amber is not easily disguised in a cocktail (such as a Donga Punch). It's lots of fun, but for dedicated agricole and funk fans. Just wish it were a tad cheaper. assez proche du st james fleur de canne vieux.